Emergency room doctors face long-term stress, making them especially prone to depression and suicide. 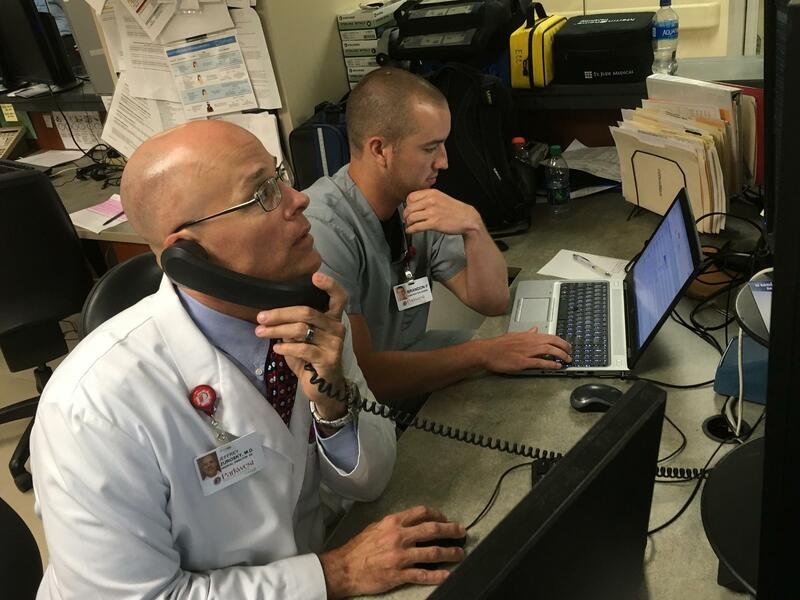 Dr. Jeff Zurosky (left) calls to order a test, as a medical scribe updates the patient's electronic health record. Alarms go off so frequently in emergency rooms that doctors barely notice — until a colleague is wheeled in on a gurney, clinging to life. All of a sudden, that alarm becomes a deafening wake-up call. For Dr. Kip Wenger, that colleague, a 33-year-old physician, was also his friend. Wenger is regional medical director for TeamHealth, one of the country's largest emergency room staffing companies, based in Knoxville, Tenn.
"It's devastating," he says. "This is a young, healthy person who has everything in the world ahead of them." His friend had confided in a few co-workers about recent relationship struggles, but none of that had affected her work. The medical profession relies on the premise that doctors and medical staff, like highly trained endurance athletes, are conditioned to clock long hours and ignore fatigue and the emotional toll of their work. But, for many in the profession, that day-in-day-out stress can lead to crippling depression. It is one reason doctors are far more likely than the general population to die by suicide. For TeamHealth, that death in 2015 sparked some deep soul searching. "A few of these things happened that were just so sobering," says TeamHealth co-founder Dr. Lynn Massingale. It has been an uncomfortable topic to confront, but the company decided to start by looking at burnout. A 2018 study from Mayo Clinic finds that doctors enduring physical and emotional fatigue are more prone to error. TeamHealth held listening sessions that confirmed what officials already suspected: The problem is endemic in hospitals. They began with a simple idea: encourage doctors to work fewer hours. 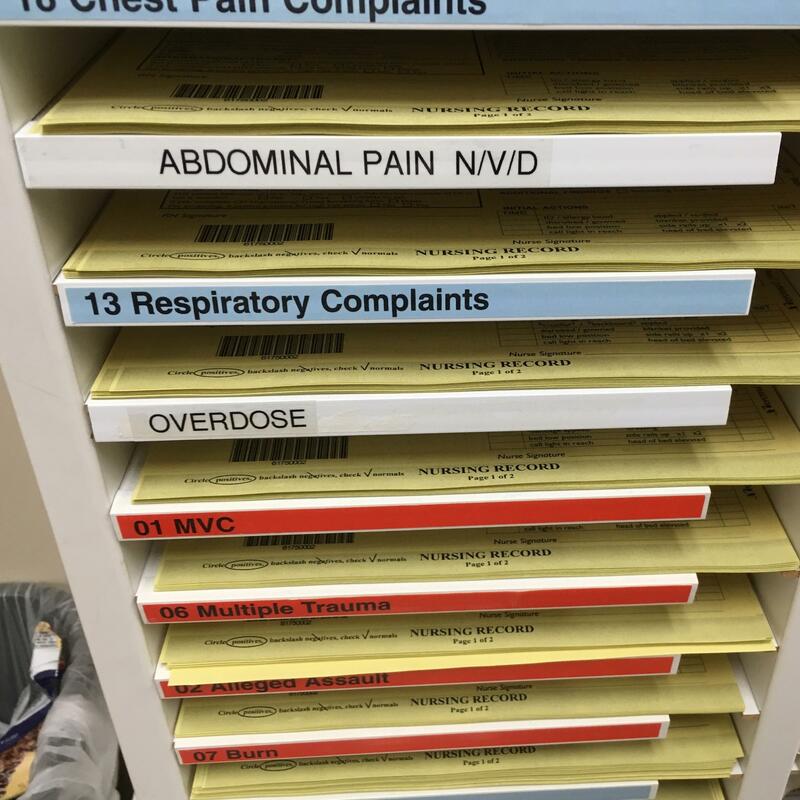 Massingale said the company average is now around 40 hours a week — though there is still no avoiding nights and weekends in the ER. The company also started a new protocol to help doctors navigate the stresses of a medical lawsuit: pair each with a colleague who has been through the process. "We can't change the facts. We're not coaching you to change your memory," Massingale says. "But we can help you deal with the stress of that." They're also working to reduce bureaucratic frustrations. A significant portion of required corporate training hours are now deemed optional. And the company has allocated millions of dollars a year for scribes, the medical staffers who trail ER physicians and enter notes into often-finicky electronic record-keeping devices. That move came after Massingale and his team identified new technology as another source of stress, diverting a doctor's energies away from core duties. Dr. Jeffrey Zurosky, an ER director at Parkwest Medical Center in Knoxville, says he worries especially about his newest doctors, the ones who are fresh out of med school with a mountain of debt and understandably eager to pick up as many shifts as possible. "I tell them: Be balanced. Don't overwork yourself. Spend time with your family. Stay married, if you can," Zurosky says. Yet to some in the medical community, the problem goes deeper than immediate culprits, such as burnout. Pam Wible dislikes that term, saying it puts the blame on physicians. Wible, a family practitioner from Eugene, Ore., points to medical schools, which she sees as perpetuating a culture that becomes ingrained — one where "powering through" consecutive work shifts means you've arrived. Wible calls it abuse, plain and simple. "These people who have been previously abused are now the teachers," she says. "They're teaching the next generation of doctors." Wible contends that when physicians find themselves needing counseling, the rules of the profession often deter them. She says that doctors can't seek psychiatric treatment without jeopardizing their medical licenses. "I know a lot of them," Wible says. "They're having to sneak out of town, pay cash and use a fake name to do it. Why are we putting these people in such a situation?" Wible has collected more than 900 accounts of doctor suicides and set up an anonymous helpline. She is getting physicians to share their stories. 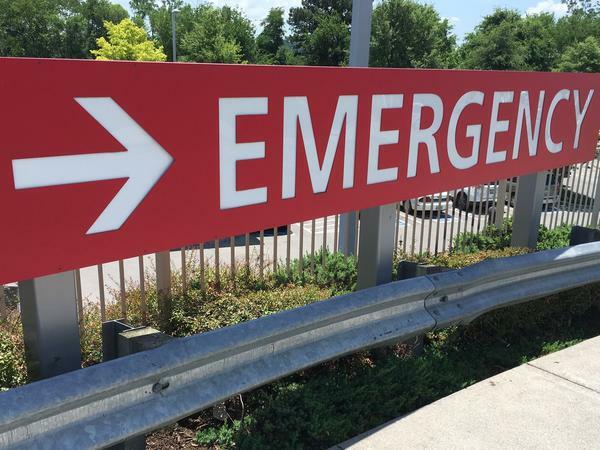 One emergency doctor, licensed in Ohio, speaks firsthand. "You don't focus on the 99 you save," the doctor says. "You end up focusing on the one that you lose." The one whom he "lost" was a 19 year-old woman who came in with the flu. Tests didn't show anything unusual. He sent her home. But she came back later, this time in cardiac arrest. The woman died, and that news sent him into a deep despair. "Like all doctors, you put that Superman cape on and you think you can get through it," he says. The dead woman's family filed a complaint, and he learned that he might lose his job. Things spiraled to where this ER doctor, with no history of depression, attempted to end his own life. Police found him in time and got him to a hospital and he was revived. He had treated untold numbers of suicidal patients, he says, but never imagined himself in their place. "I didn't know I was at higher risk of suicide than the average person." This doctor says he wishes he could speak more freely about that experience. He thinks that hearing about it might encourage other physicians to seek out help, before it becomes too late for them. This story is part of a reporting partnership with Nashville Public Radio, NPR and Kaiser Health News. (SOUNDBITE OF TAPE'S "COMPANIONS") Transcript provided by NPR, Copyright NPR.